I’ve often asked myself, what’s beneath the surface of the ocean? What’s beneath the surface of the ground I’m standing on? What’s beneath the surface of my thoughts? What’s beneath the surface of every human I encounter daily? If we could see beneath the surface, we may see things differently. If we could see beneath the surface of the physical shell of another, perhaps we wouldn’t be so quick to judge them. What’s beneath the surface of the homeless man/woman I see on the street? What’s their story? What is really beneath the surface of the comedian who is making others laugh? Are they themselves laughing beneath the surface? On a more personal note, I have learned the value in pausing to ask myself what is beneath the surface of my thoughts. Where did the thought originate? What does it mean? Examining my thoughts has allowed me to decide which ones to give validity to. Thousands of thoughts pass through our mind daily but our thoughts are not necessarily our reality. I put most of them in file 13 (the trash bin). What’s beneath what others see when they look at you? What’s beneath your surface? Is it hurt, pain, bitterness, anger? Or is it love, acceptance, allowing, and peace? Is what others see on the surface a true reflection of what is beneath your surface? These are all great questions that I have pondered for myself. I have found it necessary to go deeper than the surface to examine my feelings and thoughts. It is truly my desire to practice love with no judgment towards ALL fellow beings because I have no idea what is beneath their surface. I love the old saying, “never judge another until you’ve actually walked a mile in their shoes.” We all go through stuff. Being mindful of what others may be going through beneath the surface is an essential element of kindness. In a world where there seemingly is so much hate, judgment, and division, let your light of love shine deep beneath the surface in an effort to brighten the way for others. Thanks to all my readers for your continued love and support. You constantly inspire me to keep doing what I do. I always look forward to your feedback. You can also follow me on Facebook, Instagram, Twitter, and Linkedin. Critical Care Nurse, Thought Contributor, Published Writer, Musician, and Lover of Life. Thank u for helping me!! What s Beneath the Surf…..I have love ,.and I have , and do need to right down things tht are under their. Maybe some saw under my Surf,and he told me tht some of what think he see s..over all I am a good man! Some want s hold some of tht against being together…I have gold s and I want in this life,some us lifes or different..thank s for u say and Do….. Thank you so much for your response. I have thankful for your support and even more thankful that my writing resonates with you. I look forward to more feedback from you. Much love. Good one Vince. This really made me think and it makes a lot of sense. You never know. Thank you so much for all your love and support. You are so right. You never know what’s beneath the surface. I love and appreciate you and I look forward to more feedback from you. An enjoyable inspiring read. I personally am doing my best to promote the seven faces of intention in my life – Creativity, Kindness, Love, Beauty, Expansion, Unlimited Abundance, and Receptivity. …..Dr Wayne W, Dryer. I love that you talk about Wayne Dyer’s seven faces of intention. I wrote them down and will have them in my view daily as a reminder. Thank you for sharing. I would say this is something I learned at a younger age, examining my thoughts and I guess you can say looking beneath the surface. As I got older, life begin to unfold and in some cases has been a distraction from examining my thoughts. It was recent where a colleague of mine wrote on her workstation board “I will make an effort to see things differently!” These very words brought me back to where I examine my thoughts which means I am asking what is beneath the surface. Great Article. Thank you so much for your thoughtful response. I too think writing things down like your colleague did, is a great reminder for us to choose to see things differently. I am grateful for you and your feedback. Truly appreciate it. 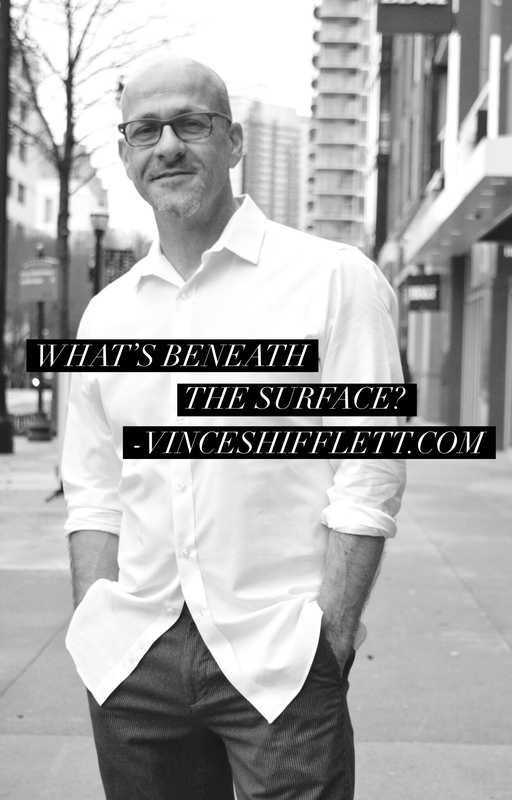 Vince Shifflett is a critical care nurse, freelance writer, blogger, musician, and lover of life. He writes regularly on matters of mental, physical, and spiritual wellness. Original Content by Vince Shifflett and Contributors. Copyright 2016-2017. All Rights Reserved.